One of the most frustrating issues a man faces as he completes his look is coordinating his tie with the rest of his clothing. 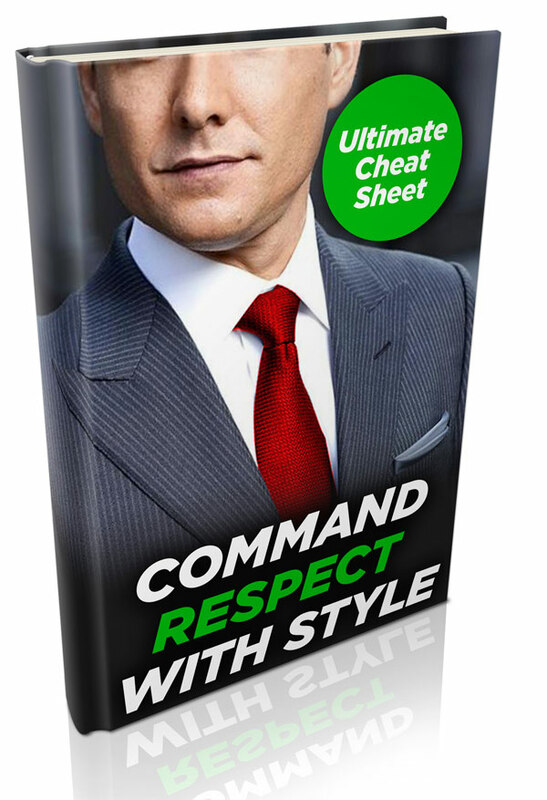 There is much confusion on the subject of matching a tie with a dress shirt as there are few rules and an endless number of variable in the equation. This article is meant to be a guide, not a list of steadfast matching rules. 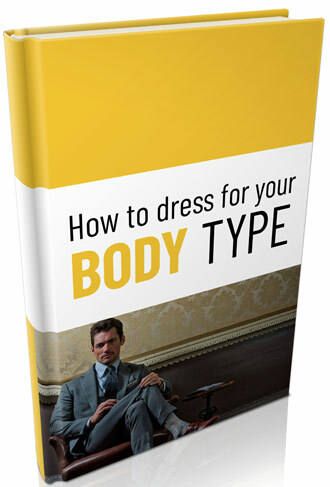 No article can predict the unlimited combinations and occasions men across the world face when dressing themselves. With that being said, if nothing else remember to keep it simple, seek to coordinate but do not be afraid to clash, and do the work beforehand to ensure your ties and dress shirts are timelessly classic to begin with thus making the exercise much easier to begin with. Solid and semi-solid colored ties are the easiest ties to match to a man’s shirt and suit. 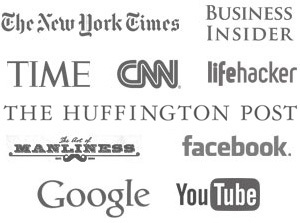 The lack of pattern enables it to simply compliment his other articles of clothing. A solid burgundy necktie can serve perfectly as the finishing touch for a check shirt and navy pin-striped suit or go just as well with the more formal light blue dress shirt and plain charcoal suit look. The smoother and shinier the silk on the tie, the more formal it will appear (assuming it is a non-flashy color). For a more casual look consider solid cotton or wool neckties – on average less formal than silk, their non-reflective surface ensure a more subtle look. Ties that display multiple narrow stripes in many different colors are common for contemporary Italian design ties. When matching such a tie, as the one displayed on the left, make sure that the patterns and colors harmonize with the rest of your outfit. 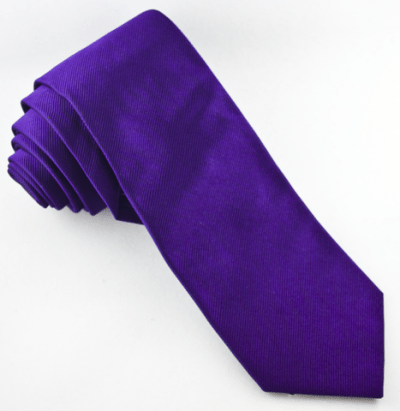 Because this tie already displays hint of purple it will look great on top of a color that is in the same family. A light rose-pink or light lavender color dress shirt is a perfect example. 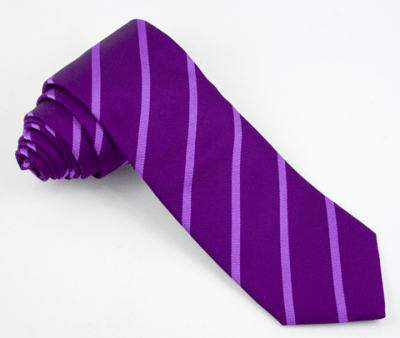 Next, have a look at the other colors on this tie. The stripes are black, tan, and brown. Every time a tie shows brown it will look better with a navy-blue, tan, beige, or olive colored suit than it would with gray, charcoal, or black suit. 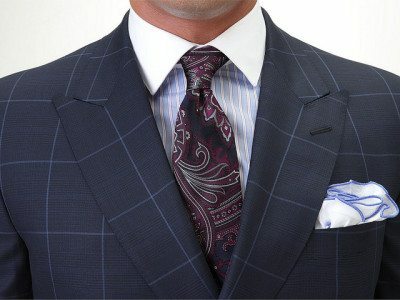 If you would like to combine this tie with other fabric patterns, make sure to choose a pattern that is larger in size. A great example is a midnight blue suit with wider spaced Prince of Wales check pattern. A classic striping pattern is defined by a simple design in two contrasting colors. The cherry-red and bright white striped tie on the left is a perfect example. Because the stripes are spaced wide apart this tie will look great on top of a narrow striped or finely checkered pattern dress shirt. Almost any suit color will compliment this tie and dress shirts in blue and white are best. The “candy-cane” striped pattern of this tie may not be welcome in any office environment. The bright white with red combination may be perceived as too loud and flashy by some. It is therefore not a good tie to wear to a job interview or when trying to make a good first professional impression. Special Note – If you are wearing an authentic military regiment tie you should have served in the unit or have the right to wear it. I know of more than a few instances where a man has been confronted by a member of the unit whose tie he is sporting. Traditional British ties are recognized by their slightly conservative striped design, dull colors, and fine ribbed fabric weave. These neckties typically have their stripes fall from right to left (when looking at the tie head-on), although the North American military tie variant falls from left to right, with some saying the reason being to simply confound our brethren on the other side of the pond. Classic colors are burgundy, amber, olive, forest green, navy, and tan. 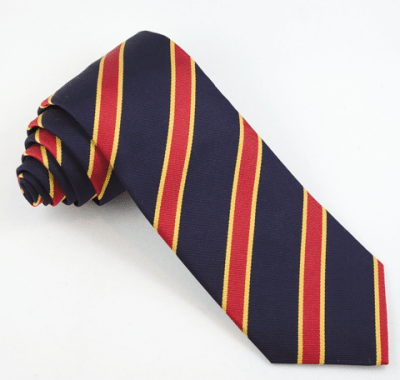 Traditional British ties are often made from stiffer fabric blends, either cotton or fine wool with delicate silk. The tie on the left is a perfect example. The burgundy red and amber-yellow color combines best with a medium-blue or white dress shirt. Also great are narrow striped dress shirts, dress shirts with button down collar, and shirts made from oxford cloth. Besides the classic 2-piece suit, British striped ties also look great in combination with dress pants and contrasting blazer jacket. The slightly rougher look of the ribbed fabric compliments coarser fabrics such as an oxford dress shirt and tweed sport jackets. The best necktie knot for these ties is the slightly asymmetrically shaped Four in Hand knot. The Paisley pattern is a tear-drop like shape that originated in Persia during the 16th century. It is said that the paisley is derived from the shape of the shoots of a young date palm – a symbol of fertility in ancient Babylonia and the Hindu religion. The paisley was a major textile motif in Persia and was used to decorate royal and religious garments. 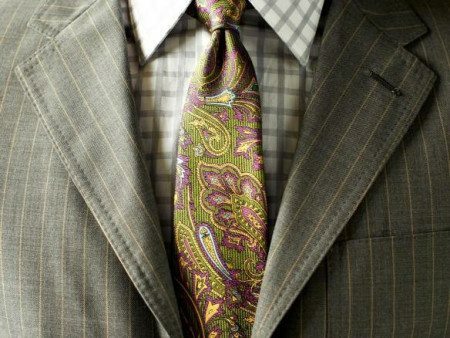 During the 1960s the paisley pattern became popular on men’s ties and has resurfaced every few years since. Most recently the paisley pattern has become smaller, almost polka dot-like size. 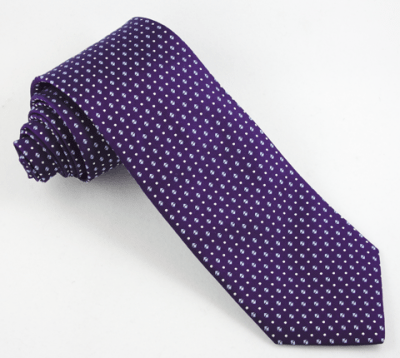 The most popular polka dot, foulard, and club ties have very small and intricate patterns that are either screen-printed onto or jacquard woven into the fabric. When combining these ties with a shirt and suit, the same principle of combining patterns applies: each clothing item’s pattern should be different in size and preferably also have a different shape. 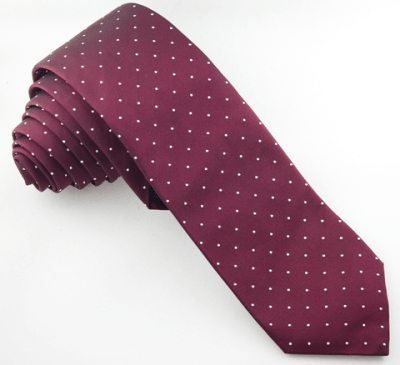 This cherry-red and white polka dot tie combines well with a blue and white checkered shirt and solid gray suit. The delicate design in combination with the brilliant shine of the silk fabric makes this tie better suited for an elegant 2-piece suit rather than a blazer or sport coat jacket.